(Phys.org) —Astronomers have found some of the youngest stars ever seen, thanks to the Herschel space observatory, a European Space Agency mission with important NASA contributions. Aaah, ooh, ooh, maybe it is because the stuff that makes gravity (the beads and the string) is more dense in some places and less dense in other places. And there is some other forces helping gravity to shape the shapes we see. Mmmm, if I had to guess those other forces might thermal energy, fluid dynamics, magnetism, electrostatics, electrodynamics and chaos (with the help of the general make up of the stuff making the beads and strings. What's your best guess? Oooh, oooh, oooh,,, I know, it must be ALL electricity. There is nothing going on but electricity, right? Well in this case it is probably because star formation is often associated with shock fronts such as from nearby supernovae but the formation of filaments also follows automatically from the gravitational collapse of low density clouds because they shrink faster on the shorter axis. That's why dark matter simulations produce exactly the large scale structure that we see in the early universe. Look up "Jeans Instability" and the "top hat model". Neither is plasma, aether, or electron ducks, so I'm in good company. It's a fictitious entity used to describe interactions. Red stars are supposed to be very old. Blue stars are supposed to be young. No lurker, their colour is merely a function of their temperature. If those young stars are red, it means that they are still heating up, the equivalent of a fire in a furnace that is not yet at full blast. Eventually they will change colour. Just remember that a young star that is heating up, can be the same colour (ergo, temperature) as an old star that is cooling down while dying. Force requires Mass and Momentum. You mixed it all up. Red stars simply live longer, while the blue ones are burning their H2 reservoirs over shorter time. But both types still have to form somewhere, right? As for the gravity argument, the whole cloud is in motion — it it at the shock sites along the filaments where the stars are often formed. Also please please please physorg, DO post links to journal references! It seems to me that once the gas becomes dense enough to start a fusion reaction that the star would immediately flash on. I don't understand how it takes thousands of years. I'm not an astrophysicist btw. Maybe the initial fusion reaction uses up the densest gas, and so it needs to re-compress? Do I know what I'm talking about? It seems to me that once the gas becomes dense enough to start a fusion reaction that the star would immediately flash on. I don't understand how it takes thousands of years. You are right but that event happens at the core, it takes thousands of years for the energy from fusion to reach the surface. Before that flash though, gravitational compression must raise the temperature to the ignition point. It remains to be seen whether we are seeing these stars before or after the fusion switches on. Also, as the gas cloud compresses the temperature rises, which will slow the formation. 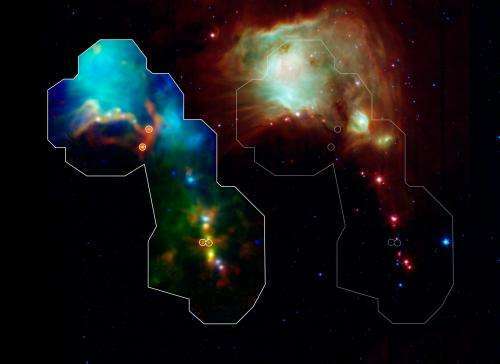 These proto-stars are being observed at room temperature, so they have a ways to go before igniting. Ooh Oooh wait I got this one! Its the cross-directional wave ripple transgressing through the inverse omni-directed di-pole moment, creating the paddling quantum duck interface which then compressing the aether warming neutrinoes! Real noob question here... But I hope someone can answer. I know almost nothing about science, but I love reading all the articles on Physorg. To my knowledge, the earliest generation of stars & solar systems formed from the very basic elements, such as Hydrogen, Helium, etc, correct me if I'm wrong. Will newer stars, younger than our own, present newer elements within it's solar system we haven't seen before? Due to the ongoing cycle of star destruction, and formation? No not the hydrogen, that is what the very first (and all subsequent stars) used as a primary fuel source. The heavier elements up to iron are by-products of the fusion process inside of stars. But the variety and abundance produced is a big subject. The elements heavier than iron form from processes that occur during and after a supernova event. Never say never, but it is extremely unlikely something truly new will be produced naturally. It's more likely that some new but already existing element might be discovered. But as elements get heavier, they become more unstable. A more detailed explanation requires nuclear physics. In nuclear physics, there is a theoretical upper limit to the number of protons which can be brought together to form a new element,,,, in nature. But there are a few new elements, very short lived, which have been produced in the lab. It's exceedingly difficult to do. My earlier answer was probably confusing, sorry. No, you are not wrong, you are entirely correct. I buggered up my commas and periods. That's right but there was no "etc. ", only hydrogen and helium. No, the process isn't cumulative. The first supernova of the first star in the observable universe would have produced every possible element in varying amounts. Present day supernovae do the same. Red galaxies are said to be "old" because they have mostly red stars. Blue galaxies are said to be "young" because they have mostly young stars. Betelgeuse is red, is much larger, and burns a hell of a lot faster. Sirius is blue, is somewhat larger, and burns much brighter than the Sun. I didn't mix up anything. The scientists mixed it all up. You mixed it all up. You are comparing old ideas of galaxies with star formation, and stars off the main sequence (old stars going giant) with main sequence stars. If scientists mix stuff up, they will be told by their peers which will subsequently get more money for research. Science is self correcting. Web comments by people too ignorant of basic astronomy and other physics to understand that they should ask instead of pontificate on observable forces and star evolution, not so much. I wondered if anyone would pick that up. Yes, but at a low enough level to be negligible in the context of this thread. Red galaxies are said to be "old" because they have mostly red stars. Blue galaxies are said to be "young" because they have mostly young stars. The Sun is yellow. Sirius is blue, is somewhat larger, and burns much brighter than the Sun. I didn't mix up anything. As you can see, it is NOT that simple or straightforward. As for this thread, you need to decide which you are talking about; stars or galaxies & not treat them as the same thing. You are aware that there is a separate colour spectrum for temperature? If something is burning brighter, it IS burning a lot faster. If you take a look at the colour temperature links given above, you will see that Sirius is hotter (therefore burning faster &-> brighter) & Betelgeuse is cooler (therefore burning slower&->not so bright) The slower a star is consuming its fuel, the lower its temperature tends to be, the longer its life is likely to be. That is a general rule thumb. IT IS ALSO A SEPARATE ISSUE TO REDSHIFT! for You really ARE one mixed up bunny. Its light is actually WHITE. The apparent yellow colour is due to ATMOSPHERIC SCATTERING. What is going to happen to our sun? Oh, and observe that there is NO green in the thermal spectrum. If ever you see that in a flame, it is impurities or other substances burning off. Nothing to do with the temperature itself. These questions are outside my field. Rate accordingly. The point of that - besides nuclear deterrent - was to gather as many unmistakable 'signatures' hall marking fusion in a point of time where that fusion was triggered. How does nature obscure signatures that can not be mistaken for anything else other than the first moment of fusion? The fusion occurs in the core, it is masked by half a million kilometers of dense plasma. Surely the energy spectrum signatures differs from all other points of time and signatures subsequent to initial fusion. What we see from the surface of the star is essentially a purely thermal background spectrum (it's not quite a black body) with some spectral lines due to elements in the surface layer. Are there no spectrum signatures that can make their way through the dust (or whatever .. The fusion process would create neutrinos which could be detected in theory but not in practice.